Breakfast is the most important meal of the day. 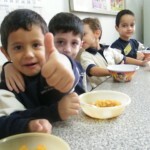 In the morning, children’s bodies need to refuel for the day ahead after going without food for 8 to 12 hours during sleep. 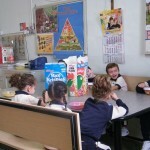 Children who skip breakfast have a tendency to be restless, are less attentive and have less energy to carry out their morning tasks. 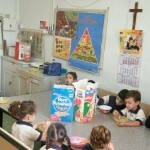 To highlight the importance of eating a healthy breakfast, on the 11th, 12th and 13th of November 2013 our school organised Healthy Breakfast Days for Kindergarten 1 pupils. 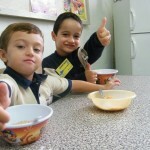 The children were invited to the kitchen and offered a healthy breakfast early in the day. 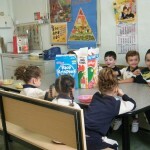 Most of the children were very excited during this activity and participated actively when Kindergarten Assistants discussed with them the importance of consuming a healthy breakfast in the morning. As parents, we must not forget how important our good example is. We must make it a habit to sit down and have breakfast with our children. This will help instil in the children the idea that before going to school they need to refuel their brain and body with a healthy morning meal.